EXHIBITION EXTENDED THRU JULY 20TH! Flux Factory, in partnership with the Long Island City Community Garden, is excited to present Nightlight, an interactive light-based outdoor installation that investigates public and private land use after dark. Nightlight opens a city-owned public space beyond regular hours, creating a location for interaction, discovery, and communication that otherwise wouldn’t exist. The installation experiments with the power of light in creating a safe space for passersby to happen upon and explore. The installation spans the entire garden, and is powered exclusively by solar energy. The participants, composed of artists, programmers, builders, community organizers, and hackers, worked collaboratively to produce this site-specific work. Nightlight is organized by Carina Kaufman and Alex Nathanson. Installation by Merche Blasco, Reid Bingham, Eozin Che, Mark Christie, Jason Eppink, Ting Feng, Regina Hong, Jung In Jung, Sean McIntyre, Will Owen, Dan Phiffer, Julius Schmiedel, and Morgan Street. 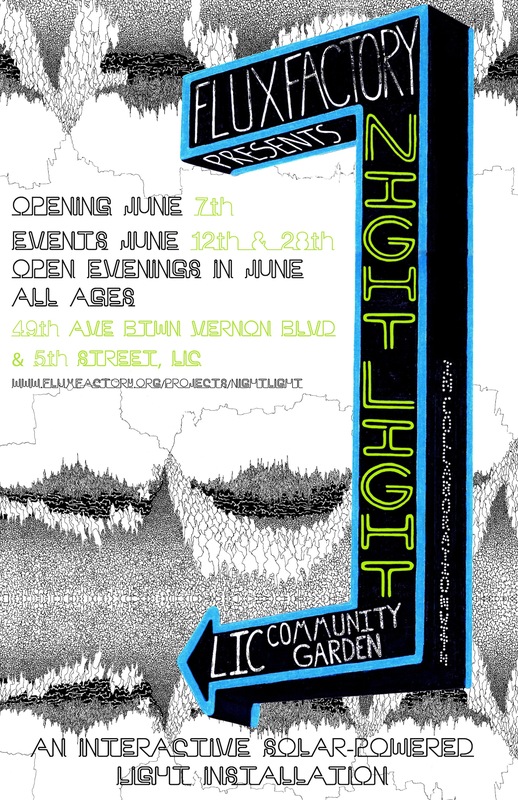 Please join us for Nightlight’s opening party on Saturday, June 7th from 6-10 pm. On Thursday, June 12 at 8 pm we will be holding Flux Thursday at the garden, an open potluck with presentations by Nightlight participants. Performance by Merche Blasco on Saturday, June 28th. Admission is free. Image by Danae Lagoy. Special thanks to Shona Masarin, Aliya Bonar and Liliana Gutierrez. Nightlight is supported, in part, by the New York City Department of Cultural Affairs in partnership with the City Council, the Andy Warhol Foundation for Visual Arts, and the New York State Council on the Arts with the support of Governor Andrew Cuomo and the New York State Legislature. next post: June Flux Thursday: June 12!